Following on the steps outlined in mhVTL on CentOS to install the mhVTL, this guide adds the web based mhVTL-GUI into the mix. Note for the example below I am using a CentOS 6.7 minimal installation as CentOS or RHEL 7.x iSCSI has changed significantly enough not to work with the GUI. Original developement by Nia on the mhVTL-GUI has been suspended after years of hard work and great support. A fork of the GUI is now available at https://github.com/markh794/mhvtl-gui however is not being actively developed against. Recommend a reboot at this stage to commit all changes. 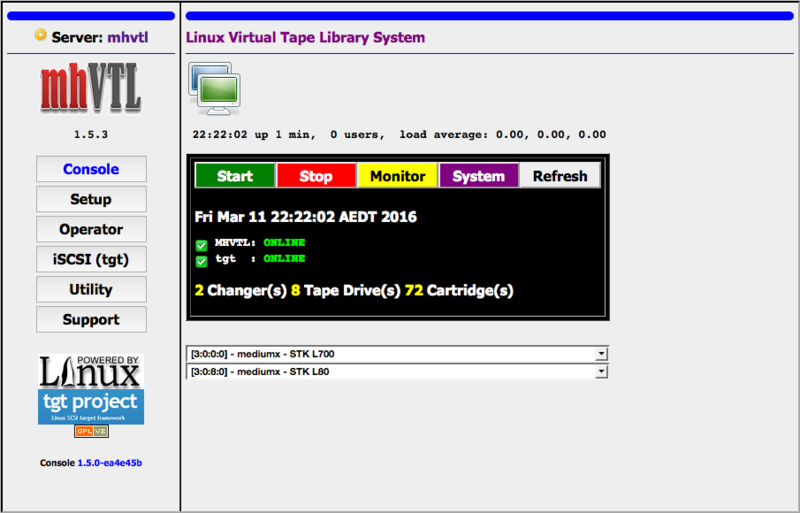 Now you can access mhVTL-GUI via a web browser (eg http://hostname/mhvtl/). The default password is mhvtl. You can configure VTL from a set of preset from Setup-> Add -> Standard. You can configure iSCSI target from iSCSI(tgt). Use Quick Start for default setup. After changing iSCSI configuration from the web GUI, check that tgtd service is running and restart it otherwise. With your easy to follow steps the setup worked on the first try.